View real time water quality monitoring of the Glenbrook wetland system! This great animation by Susdrain shows how SuDS work. These SuDS have been designed to treat water that runs off Houndsden Road every time it rains. 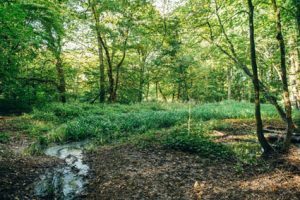 Run-off is directed along the verge in a shallow ditch (known as a swale) and into the natural woodland basin of the Spinney, where chemicals which would pollute the river are naturally and safely used by plants to grow or broken down by bacteria in the soil. 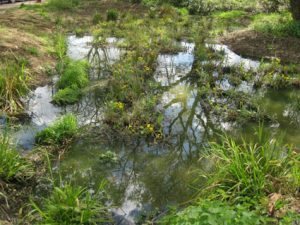 A wetland system has been created here to filter water that runs off Branscombe Gardens and Seaforth Gardens, before it is allowed to enter Grovelands Park stream and in turn the Salmons Brook. Two rocky outfalls bring surface water pipes above ground and direct water through shallow ditches into the wetland treatment basin. 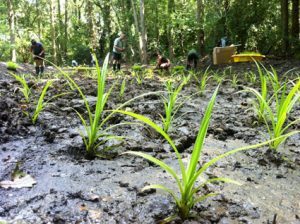 Reedbeds are another type of wetland system. 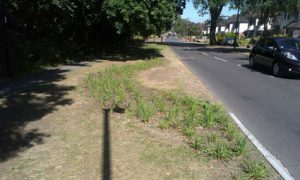 Here you can see a reed bed we’ve created in Grovelands Park lake. 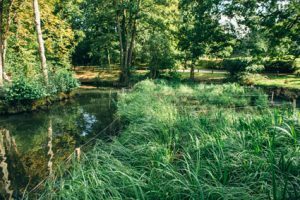 This 200m² reedbed filters water which enters from a large network of surface water drains before it flows out into the lake and eventually joins the Salmons Brook. When the Glenbrook (a river which feeds the Salmons Brook) first emerges above ground it is already badly polluted. Wetlands have been created here to filter pollutants from the stream which is directed through a series of six linked treatment basins. 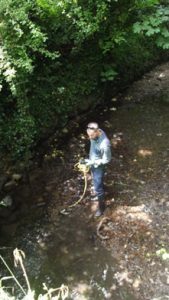 Thanks to the Environment Agency – who supplied the equipment – you can watch real time water quality monitoring data on the Glenbrook here. We’ll be analysing this data to see the impact of the Glenbrook Rainscape. 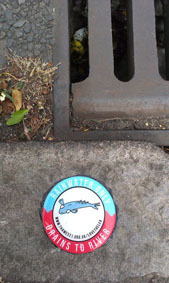 Mini SuDS or ‘wetland boxes’ take water from roofs and help slow the flow of water into surface water drains. 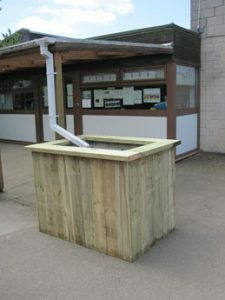 We have delivered these Rain Planters to schools close to the Salmons Brook to educate young people about the benefits of wetlands and to help reduce local flood risk. Our Love the Lea educational programme has been active around key locations across Enfield, to engage young people with the issues and inspire them with solutions. 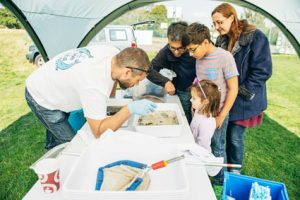 Local river celebration events across the catchment have engaged new audiences by giving people the opportunity to explore and better understand their local river environments. Alongside delivering wetland schemes, we are improving access to waterways so more people can benefit from their local streams and wetlands. 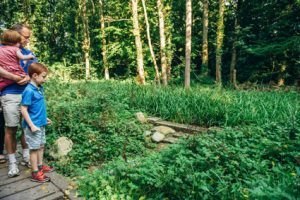 Over the course of this project, we have been monitoring the impact of our work on the health of the Salmons Brook in a number of ways. To test how well our wetlands filter and break down harmful pollutants we have been studying changes in water chemistry in our field lab. Comparing water quality in local waterways over time can tell us how effectively the wetland schemes are working. We are in the process of compiling a report to share our findings which will be publically available when it’s complete. To study the improved potential of the river habit, we have carried out a number of invertebrates surveys around our project sites. For more information about this project or to get involved, please contact John Bryden at john.bryden@thames21.org.uk. In November 2017, our work at Salmons Brook was highly commended in the Sustainable Water Industry Group (SWIG) awards in the ‘project’ category.